Add that extra sparkle for your special occasion attire with the right pair of earrings. Think of how these yellow and orange Swarovski crystal earrings cam enhance your entire look. They.. These dainty dangle earrings feature Swarovski crystal hearts that hang on sterling silver cha..
You are sure to get compliments while wearing these sapphire blue and green dangly earrings.&n.. If you want a pair of brown dressy earrings to finish your look, these earrings which are made.. If you are looking for coral earrings to match your dress, these could be the ones for you. ..
Fuchsia is a beautiful color that can look very flattering on you. These earrings consist of ..
Lilac is such a pretty color and perfect for spring. These earrings contain faceted jade.. If you are a bridesmaid or in need of a pair of mint and seafoam green dressy earrings, these e.. These earrings are a blend of two shades of orange. They are made with faceted jade and agate semi.. 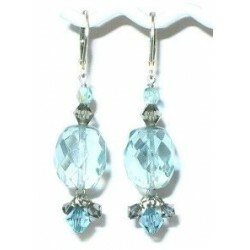 These teal bridesmaid earrings are made with faceted jade beads, Swarovski crystals and rhines.. These earrings consist of faceted and smooth jade rounds, rhinestone rondelle spacer beads and fre..